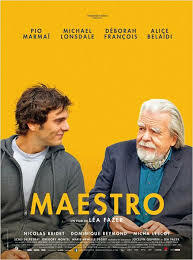 Lea Fazer’s Maestro is a delightfully funny film about co-writer Jocelyn Quivrin’s experience as a young actor of working with veteran French film director Eric Rohmer. Quivrin appeared in Rohmer’s 2007 film The Romance of Atrea and Celadon. Tragically he died in a road accident in 2009 – Rohmer died the following year at the age of 89. Maestro plots how, under the guiding hand of a true master, a young actor uncovers the beauty of his craft. It avoids cliche and pedantry, preferring humour to engage the audience in the voyage of discovery. Pio Marmai is Henri, a jobbing actor who works his way from one audition to another with little success. His agent finally sends him to read for a film by the renowned art house director Cedric Rovere (Michael Lonsdale). To his surprise he is given the role and sets off on location with his best friend and room mate Nicoballon (Nicolas Bridet). The film turns out to be a low budget production set in a small town in the middle of nowhere and intially Henri is incapable of taking the job seriously. But the director takes a special interest in Henri and by gently encouraging him to look deeper into the role, he begins to understand the groundwork essential to becoming a good actor. The casting of Marmai and Lonsdale in the lead roles is the key to Maestro’s success. Marmai, has already shown his worth in Pierre Salvatori’s Dans La Cour alongside Catherine Deneuve and Marc Fitoussi’s La Ritournelle with Isabelle Huppert. He is good-looking and exudes a cheeky charm which perfectly suits this role as an actor who gradually moves away from the idea of himself as a Hollywood-style action hero towards an artist of substance. Lonsdale, a veteran actor with a career spanning over 50 years gives a low key, perfectly nuanced performance as Rovere. Here is a man who sees filmmaking as a real collaboration between director, actors and the detailed and creative interpretation of a script. In recent years, art house films have lost favour with audiences as the film world has lost director’s like Rohmer, Resnais, etc. Maestro is a wonderful reminder of the integrity and passion these filmmakers brought to the septieme art and their invaluable contribution to classic French cinema.